US - Two letters, one hundred years ago, by the generous hand of France! Two symbols, double memory! Two initials that together they were enough to form a flag, the New World. United States! United States of America, we salute you! 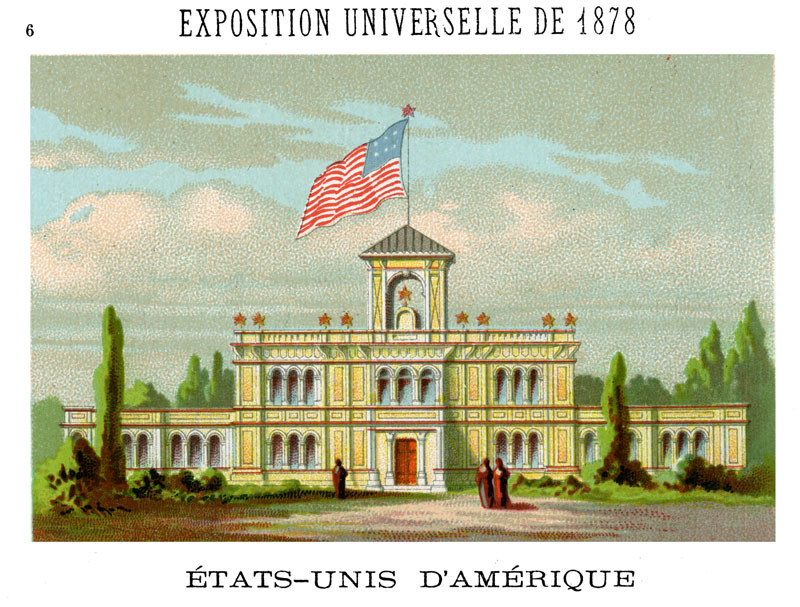 On the front of the American Union, these two letters are repeated everywhere, and, below them, the starry flag, 13 stars, the 13 original States of the Union, with French colors, blue, red and white. We can't stop at the front without feeling an emotion legitimate, because there's much blood of France in the veins of these energetic men who haven't taken a century to found this settlement so powerful and so rich today with which the old world will be starting tomorrow, maybe! We will see later, while visiting the U.S. exhibition, how much power these people reached. Here, we exclusively examined the facade it has built on our street Nations. Accurate picture of his masters, still practice the civilized nomad tent, which can be taken apart and rebuilt in a day to follow its owner everywhere he goes, from the Savannah from Ohio to the grassy plains of Texas. Hung everywhere, badges of state and gathered by the magic word: Time is gold ! On these patches, the canting arms of each State. Connecticut: 3 vines. O my France, I see you smile. Massachusetts: the defeated Indian with his bow useless when the white man has made talk the powder. Pennsylvania: three sheaves of wheat, daughters of the earth, a plow, the first thought of man, a ship that eternal trafficker. New York: A rising sun, brilliant allegory! sun high up rather in the very zenith the sky. Vermont: three sheaves of wheat, a lion, a fir tree. Virginia: An Indian who terrace a crowned king , with this motto Sic Semper Tyrannis, the crown falls and will be trampled. Is that you, future? South Carolina: two shields joined together, on one, a palm tree with the words: Animis opibus que parati, on the other, a woman standing with this motto: Dum Spiro Spero. So shoot such people! North Carolina: Two women, one sitting on a cornucopia, the other Respublica, holding the Constitution, and at the end of his spear the red Phrygian cap. Rhode Island: An anchor, the sea is there. The Delaware: An ox, a sheaf of wheat and an ear, soft symbols of agriculture. New Hampshire: A lighthouse, a sunrise and a ship ready to be launched into the sea. The District of Columbia: With a Republic in a red cap, still wearing the Constitution under this date: 1871. 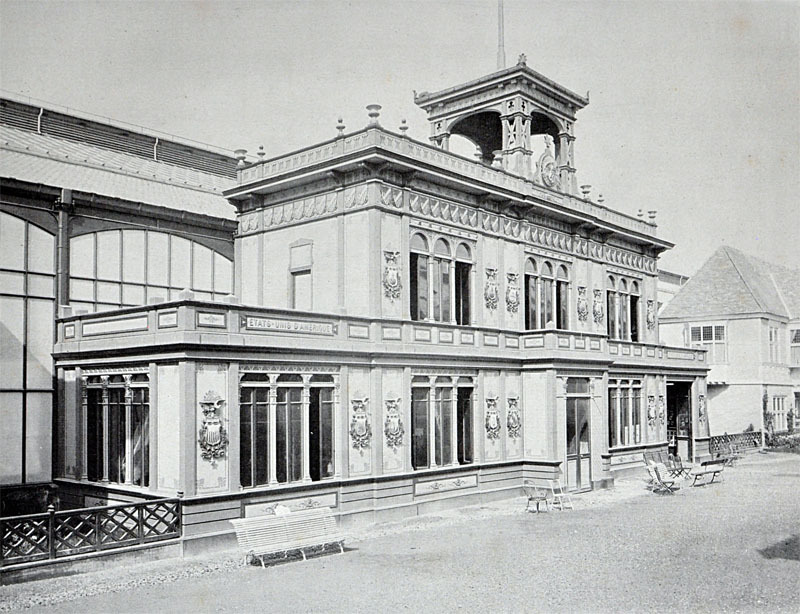 At the pediment of the facade, the eagle bearing the shield of American national, flag of the sea, which makes thinking there the leopard of the Old England. Take care! peoples of Europe. The American land was only yesterday, your dependent, and now it's enough in itself, tomorrow it clogging your markets, and the day she will want more, it comes, you sell bales of cotton or its wheat, the axis of the commercial world will be changed! 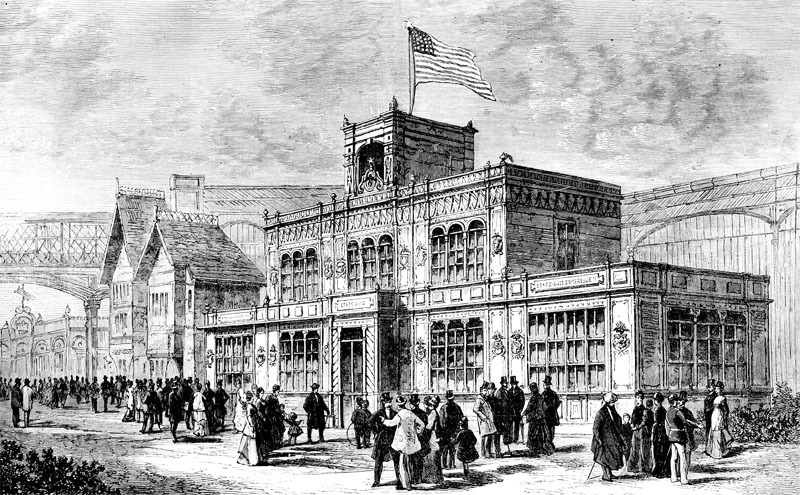 Front on Street of Nations, description: The pavilion of the United States of America is a building in the type of houses that are raising the rich American colonists, in which iron and brick play the greatest role. Both elegant and practical, this beautiful building gives us the exact model of the buildings constructed by the active inhabitants of the New World.